This film version takes the doomed queen's famous line literally, beginning the movie (spoiler alert) with her sombre execution. 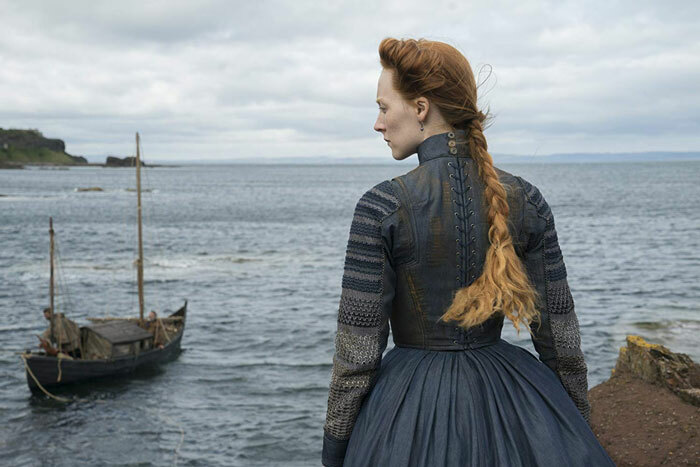 We then spin the clock back to 1561, as the young queen (red-haired, alabaster-skinned, played impeccably by Saoirse Ronan, albeit with a Scottish accent someone who grew up in France is unlikely to have acquired) lands in Scotland (windswept, rainy, largely empty but for grim grey castles with stone walls and no natural light) to assume her rightful role as ruler. Until then, the throne has been kept warm by Mary's half-brother James, Earl of Moray (James McArdle, long hair, eyeliner, hipster bushy beard), and the arrival of a Catholic woman to take the reins sets the cat among the pigeons in Protestant Scotland. Particularly exercised is David Tennant's John Knox (long hair, hat - well, looks like John Knox, basically). 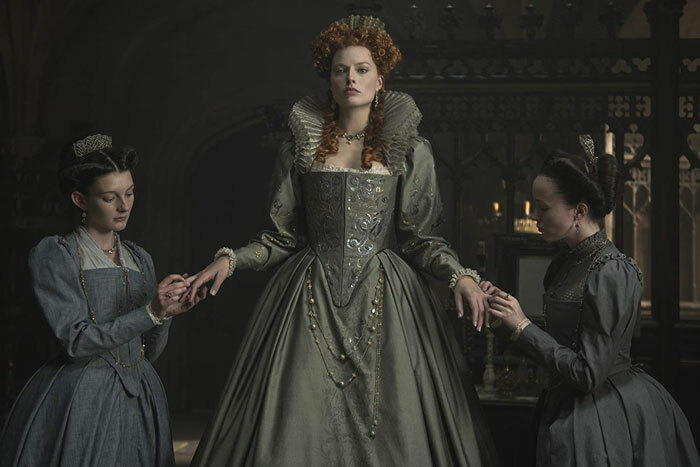 More conflicted is 'sister queen' Elizabeth (actually Mary's cousin; wig, lipstick, ages badly, played by Margot Robbie with an unnecessary prosthetic nose, which, as we naturally big-nosed people know to our chagrin, is always a neat shortcut to indicate ugliness and/or the desire for an Oscar.) Where was I? Oh yes, down in Englandshire (green, full of elaborate palaces, looks much warmer than Scotland), where Mary's dashing cousin Lord Darnley (Jack Lowden, foppish blonde hair, neat hipster beard) is heading North to win the heart and crown of Scotland. Which wouldn't bother me (certainly the colour-blind casting didn't – the Royal Shakespeare Company's been doing that for yonks) did the film not take itself so goddamned seriously. Opening with three paragraphs of context-setting, with its pedestrian script (disappointing, given it's penned by House of Cards' Beau Willimon), endless stolid marching around by very small armies and dour privy council discussions between men in black hats, Mary Queen of Scots never lets us forget that we are watching HISTORY unfold – slowly, ponderously and without any sense of humour at all. How can a story with so much action seem so – dare I say it? – boring? It soooo doesn't want to be Blackadder, and it couldn't be more different from the witty, bawdy, sweary world of The Favourite – and yet somehow both these irreverent, often ridiculous comedies capture the spirit of their age far more convincingly than this sober set piece.